The European Patent Office (EPO) has invalidated and revoked Edwards Lifesciences’ Spenser patent that was used to prevent Medtronic from selling its CoreValve system in Germany. In August 2013, Edwards Lifesciences announced that the injunction against sales of Medtronic’s transcatheter heart valves in Germany has gone into effect. The EPO issued a preliminary opinion in October 2013, which questioned the validity of this patent. This opinion led the Higher Regional Court Karlsruhe to order the discontinuation of the prior court ruling, which blocked Medtronic from commercially marketing or selling the CoreValve system in the country. The EPO’s new ruling is subject to further appeal. Medtronic senior vice president and Medtronic Structural Heart Business president Dr John Liddicoat said: "Medtronic is very pleased with this ruling as it will ensure that patients across Europe who need aortic valve replacement will have access to this life-saving therapy." Medtronic has designed the CoreValve system to overcome the challenges of a broad range of transcatheter aortic valve replacement patients. The CoreValve system has a small 18Fr profile for all four valve sizes, which minimizes trauma at implant, and allows physicians to treat patients with small or calcified vasculature. The device features nitinol frame, which prevents unwanted leakage and optimize blood flow. The system is suitable for patients with native valves of nearly all sizes. Medtronic obtained CE Mark approval for the CoreValve system in 2007 and the US Food and Drug Administration’s approval for patients at extreme risk for surgery in January 2014. 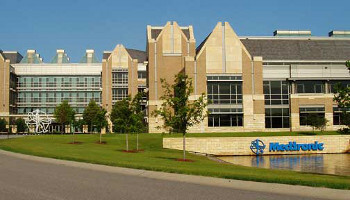 Image: Medtronic’s world headquarters in Minneapolis. Photo: Courtesy of Medtronic Inc.